No two homes are the same. All families are unique. And, cleaning needs vary. That's why Eureka® developed the MyVacTM. 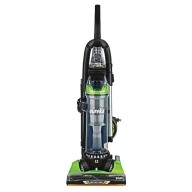 Based on the popular Eureka® AirSpeed® product line that offers powerful cleaning performance, the Eureka® MyVacTM with AirSpeed® Technology lets you select from a variety of customizable features to create a vacuum that fits your unique home, family and cleaning routine.